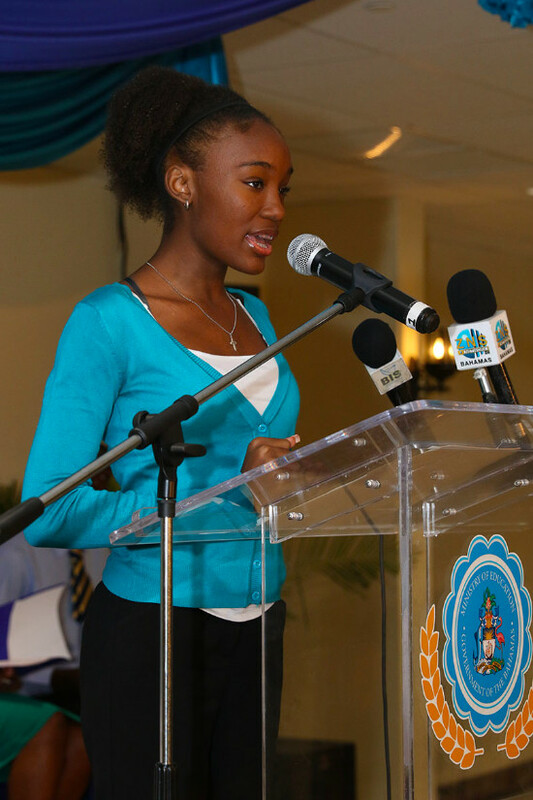 Minister of Education, the Hon. Jeffrey Lloyd. 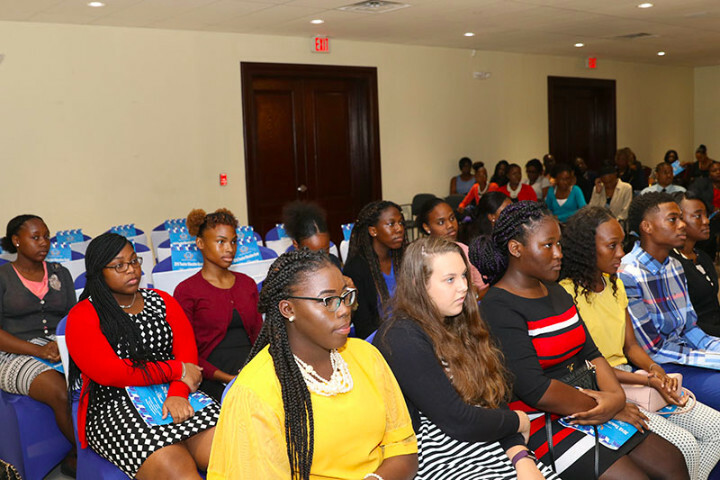 NASSAU, The Bahamas - The Government of The Bahamas has invested in 54 teacher education grant recipients who have been awarded scholarships tenable at the University of The Bahamas. The group, comprising four young men and 50 young women from across the archipelago, received their certificates and special awards during the first Teacher Education Grant Award Ceremony, August 13, 2018 at National Training Agency. In return for the government’s investment in them, the Minister of Education, the Hon. Jeffrey Lloyd admonished the students to be “creatively disruptive” -- in a state of constant renewal -- and giving back to their society. Some of the officials at the Teacher Education Grant Award Ceremony. “You are called to produce and be better than the generation before you. Give back to your society, your family, your country. You are gifted, talented, amazingly wonderful. You have no excuse. You are not paying for your education. All you have to do is go to school, study and get the best possible grades. Get it done,” he said. 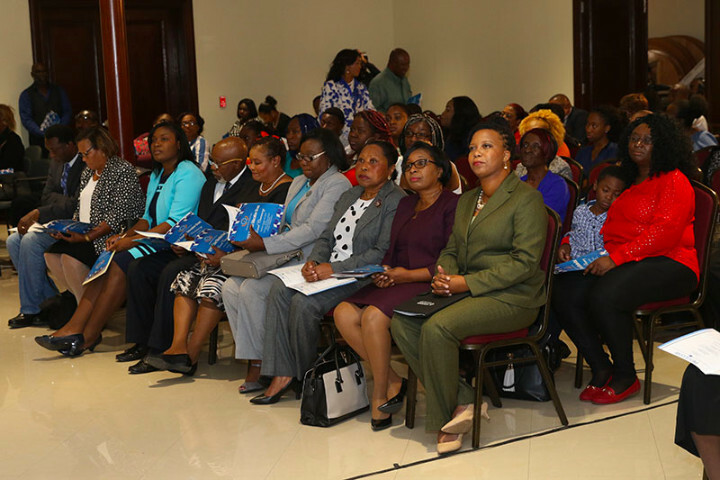 The ceremony was attended by officials including Senator Jennifer Isaacs Dotson; Dr. Rodney Smith, president, University of The Bahamas (UB); Lorraine Armbrister, Ministry of Education permanent secretary and Marcellus Taylor, director of Education. Officers of the Ministry of Education Scholarship Unit, family and well-wishers were also present. 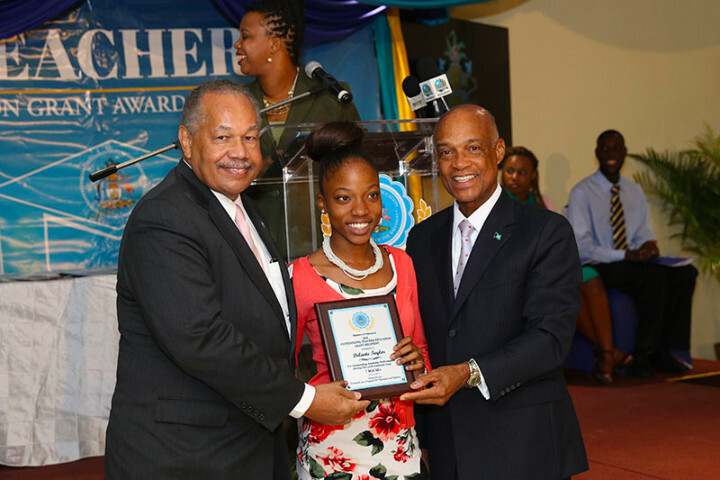 Delante Taylor, a graduate of Doris Johnson Senior High School receives her certificate from Dr. Rodney Smith, UB President (left) and the Hon. Jeffrey Lloyd, Minister of Education. 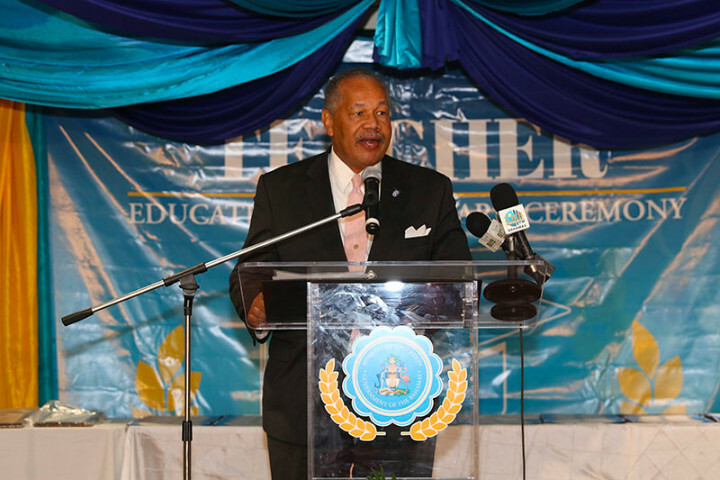 He told the recipients that the teaching profession is undergoing a “revolution” in The Bahamas. “This year we are going to increase by 1,000 the number of three-year-old’s that will enter our educational system. That 1,000 will be repeated every year for the next five years. Beginning this September, we are going to roll out a 100 percent digitized educational system. Every school will be a smart school (172 of them). Every education building (60 of them) will be a smart school and a smart building. All our pre-schools and primary school students, some 30,000 of them are going to have a tablet in their hand. Their teachers and teachers’ aides will have a lap top. By June next year this educational system will be brand, spanking new because of technology. “That means that you are going to have to be different. No more chalk and talk. Those days are over. Your classroom is going to be a laboratory of knowledge and information, and you are going to be a co-producer of that knowledge and information along with your students. Your students may not be sitting before you. There will be distance education, there will be virtual classrooms. Very soon virtual schools will be coming,” said Minister Lloyd. Some of the recipients of the 2018 Teacher Education Grant awards. 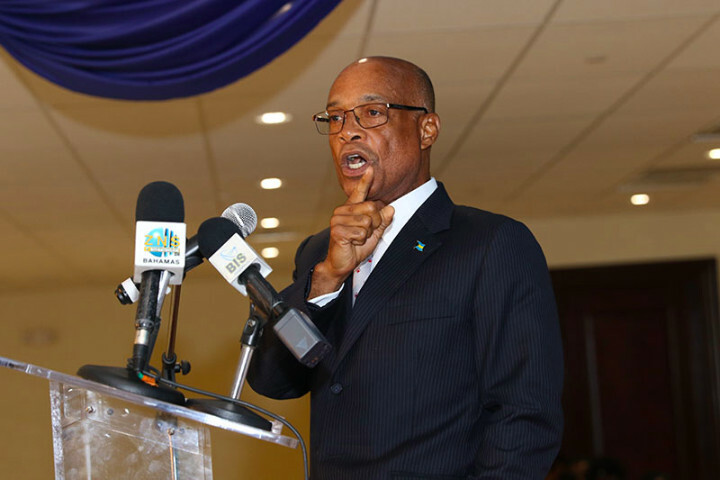 Minister Lloyd expressed his appreciation to UB President, Dr. Rodney Smith and his team, who he described as a “critical” part of the exercise of teacher preparation and continuing development. He also thanked Mr. Smith for his contribution to the Department of Education and for the leadership he has displayed since his return to the institution. Further, he acknowledged parents of the grant award recipients and appealed to them to continue to support, encourage and exercise patience with their children. Dr. Rodney D. Smith, President, UB, gives remarks at the 2018 Teacher Education Grant Award Ceremony. The Hon. Jeffrey Lloyd, Minister of Education, is pictured centre with the Teacher Education Grant Award recipients at the award ceremony, August 13, 2018 at National Training Agency. 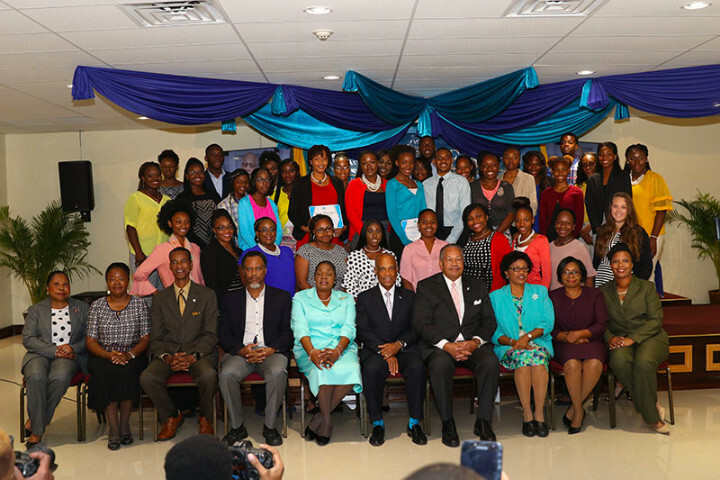 Also shown at centre right is University of The Bahamas President, Dr. Rodney Smith; Lorraine Armbrister, permanent secretary, third right; and Marcellus Taylor, director of Education, fourth left – with other Ministry of Education officials. Teniece Ingraham, a future Early Childhood Teacher and graduate of St. Andrews School talks about her goal of becoming a teacher.